Home/Uncategorized/Outdoor Wedding verses Indoor Wedding, which is right for you? Do you see yourself getting married in a beautiful outdoor setting or in a stunning indoor venue? Brides should first consider the advantages and disadvantages of each ceremony. Let’s find out the pros and cons of outdoor and indoor weddings, then determine which is right for you. Natural landscapes make beautiful settings for wedding ceremonies and create a breathtaking backdrop for photographs. Couples that choose outdoor weddings also save on decoration costs, since the scenery provides visual interest with minimal decorations. 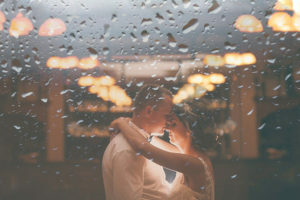 “Rain on your wedding day” is a saying on how vulnerable outdoor wedding can be from unpredictable mother nature. No matter how much tent coverage you have, even a light rain and a slight breeze can ruin your special day. You must also rent expensive tents to protect the guests against the brutal Texas sunlight and other elements, which will cost literally thousands of dollars. Additional costs like the movable dance floor, folding tables, chairs, and outdoor lighting can make the outdoor weddings VERY expensive. Indoor venues like the Event Center at Plaza Lecea, offer most of these items as standard, leaving the brides and groom with the budget for a honeymoon. The popularity of the outdoor wedding also makes reservation hard, and brides must plan way ahead. Outdoor weddings aren’t for the faint of the heart. However, “Plan B” that involves an indoor venue can save the day. Extreme temperatures or rainy forecasts can’t ruin an indoor wedding, and guests will be very comfortable even in scorching Texas Summer. Guests with high hills will also appreciate not having to navigate the rough terrain, and not having to sweat outdoors all day. And don’t forget the ferocious mosquitos having an all-you-can-eat buffet on you and your guests. Bug spray doesn’t exactly make the most romantic centerpiece. The décor options are “endless” with an indoor wedding venue. Ceilings, walls, and floors become a vast canvas to display spectacular decorations. Also, the rain and strong winds will not destroy all your hard work. Your festivities will feel intimate and comfortable. Wedding party and guests will appreciate central air conditioning. And distractions from pets barking and cars passing by. More comfortable and less distracted the guests are, more likely they will shower you with adulations! Space may limit your guest count, depending on venue accommodations. 2017 might have been the year of the outdoor wedding, but many Wedding Planners believes that couples will reclaim indoor spaces in 2018. This is because Millennial brides and grooms are clever and practical shoppers. The types of venues that are driving this trend, however, aren’t your average banquet hall or a restaurant. Couples are choosing to do their nuptials in lofty, rooftop venues that provide a grand view, air-conditioned comfort, and customization.